Thursday was our last day. 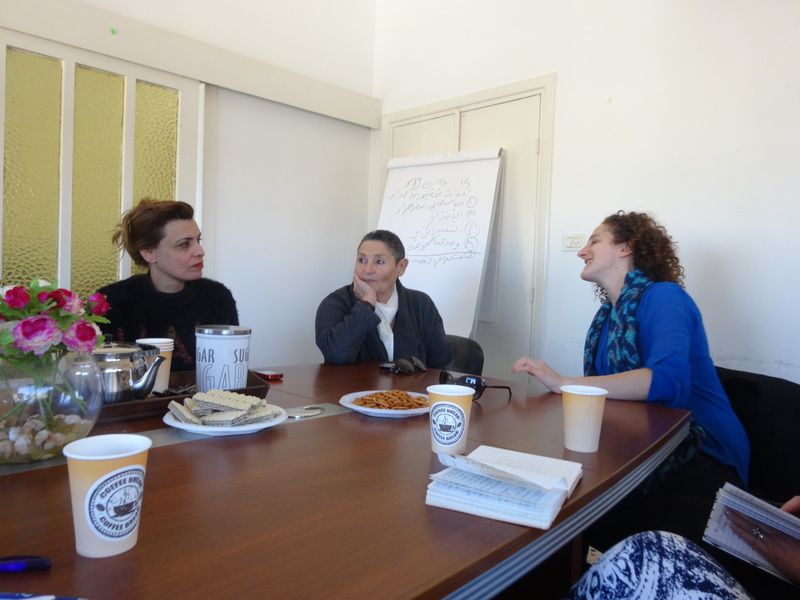 In the morning we had a meeting with mothers from the Bereaved Families Forum in Bethlehem. The Bereaved Families Forum, also known as Parents Circle Families Forum, http://www.theparentscircle.org, is a joint Palestinian Israeli organisation of over 600 families, all of whom have lost a close family member as a result of the prolonged conflict. Joint activities have shown that the reconciliation between individuals and nations is possible and it is this insight that they are trying to pass on to both sides of the conflict. Moreover, the Forum has concluded that the process of reconciliation between nations is a prerequisite to achieving a sustainable peace. The organisation thus utilizes all resources available in education, public meetings and the media, to spread these ideas. We met Robi Damilen and Aisha Khatib who had both lost sons in the conflict. Robi’s story was printed in the Huffington Post on Jan 30th 2015 so here it is:‘The 3rd of March marks the anniversary of the worst day of my life. It is the day my beloved son, David, was killed by a Palestinian sniper while serving in reserve duty at an Israeli checkpoint. The checkpoint was removed the very next day and never put back which leads me to believe that it was not exactly critical to the security of Israel. David was a student at Tel Aviv University studying for his masters in the Philosophy of Education. He was part of the peace movement and one of the officers who did not want to serve in the Occupied Palestinian Territories. Nevertheless, he felt it his duty, after much consideration, to go and serve when he was called up. Never assume that you know who the person is behind the gun. The 3rd of March was the day when I understood and told the Israeli army that no one should be killed in the name of my child. I realized that it would just contribute to the cycle of violence and that revenge would not be the path that I would take. I also understood that all mothers, regardless of color, creed and ethnic identity shared the same pain when losing a child. I understood that Palestinian and Israeli mothers should stand on the same stage and speak in the same voice to end the violence and to prevent other families from suffering this dreadful loss. The 3rd of March is when Congress will be exposed to Israel’s fear for the future, an “Orange Alert”. We, who have not managed to end the conflict in our own territory, feel it incumbent s to blunder in, ignoring all extraordinary and established friendships and create panic, hatred and a call to violence. The 3rd of March plus 14 days Israel will hold its elections. Could this possibly be a ploy to bring the Israeli public to standing ovations influencing their choice for the future? Is this a manipulation by the powers that be? Such eloquent rhetoric. Let us not be swayed by threats of annihilation which seem to be the order of the day for so many world leaders and let us find a way which could lead to an agreement. The 3rd of March will remind me of the dreadful war this past summer, of the more than 2,000 Palestinian deaths, of the 2000 more reasons to hate, of the Israeli soldiers who lost their lives in a futile battle, which led nowhere and left those living in the area filled with a sense of dread for their future. Did all this killing lead to negotiations or to a peaceful solution? Certainly not. No women were asked to come to the table to decide on war, no mother was invited to talks on a cease fire and certainly not to any peace negotiations. Mothers and children are the ultimate victims of the madness of war. Women Wage Peace – Mission Statement. The “Women Wage Peace” movement is a non-political, broad-based, and rapidly growing movement of thousands of women, taking action to influence the public and political arena. We want to restore hope and work towards a peaceful existenc e for ourselves, our children and future generations. Our Goal: To prevent the next war and lead to resolution of the conflict that is non-violent, respectable and agreeable to both sides – Israeli and Palestinian, within four years. Basic Assumptions: 1. Most women in Israel would support a political agreement. 2. Involvement of women would result in better and more effective peace processes. 3. A political agreement will secure our future and lead us to a long-term and stable solution. 4. 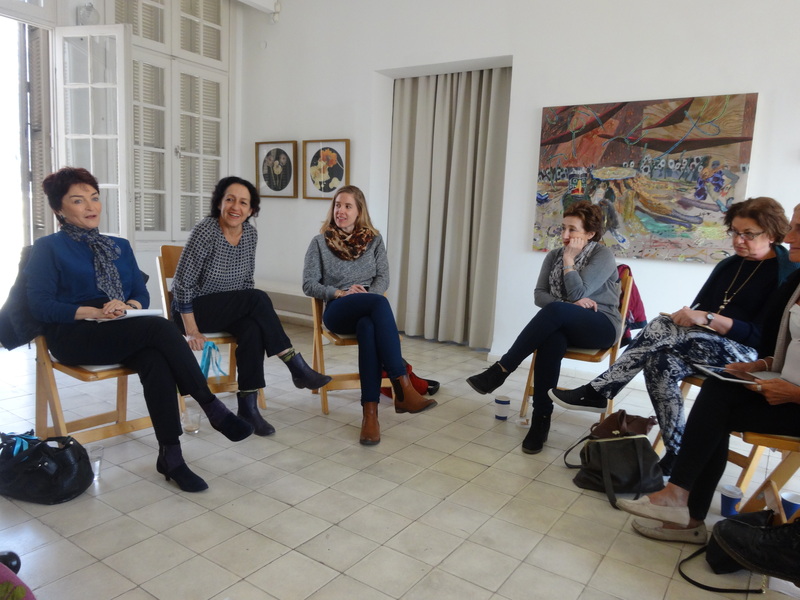 Cooperation between Palestinian and Israeli women working together to promote the movement, in rapidly growing groups, will increase the chances for a sustainable solution. ups of society to join us. 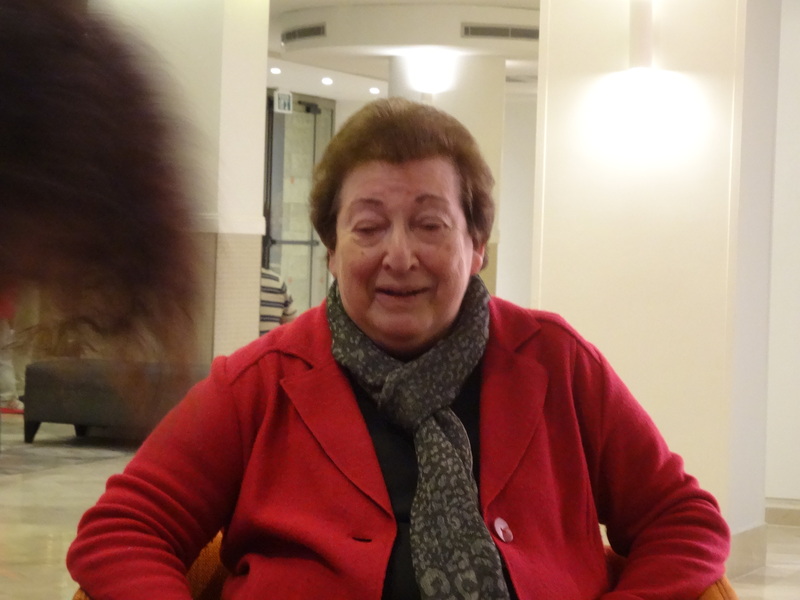 In the early evening we were really pleased that Naomi Chazan – former deputy speaker of the Knesset, women’s rights campaigner and Dean of the School of Government and Society at the Academic College of Tel-Aviv-Yaffo agreed to meet with us. She gave us some interesting insights into the forthcoming Israeli elections : “The price of maintaining the status quo by far outdistances all the alternatives”. Naomi told us how important the women’s vote in Israel, which is growing. She cited 5 important factors to consider for the election results (too long for now) , but based on them all anything could happen and it will be a “bloody scrimmage”. Emotion – the fear factor milked greatly by Bibi. Taking into account all the variables, it will be hard to make any predictions! Why should my security be at the expense of another? Why should my right of return be at the expense of someone else’s right to remain?